I'm all about apps that help fix the little things RIM won't let us change. Bla1ze checked out LEDReset a few days ago which is a great app, and today I came across ForceRadioOn from our buddy Fabian Heuwieser. 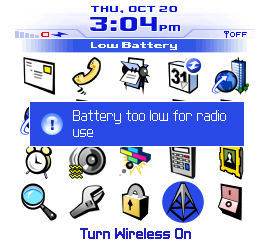 ForceRadioOn does just was it says - it will keep the radio on your device active when you get the dreaded "Battery too low for radio use" message. The app is very small and runs any device with OS 4.3 or higher. Best of all it is 100% free. You can grab ForceRadioON from your device OTA at CrackBerryAppStore.com.